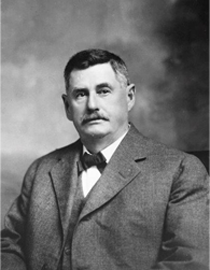 Thomas (Pappy) M. Brumby was co-founder and second president of The Brumby Chair Co. which he helped organize 'and build with his older brother, James (Jim) Remley. He was born November 16, 1852, near Goodman, Mississippi, the tenth child of Catherine Sarah Remley and John Greening Brumby. He first visited Marietta in 1864 during the height of the Civil War when he came to see his brother Robert who was killed in an engagement around Kennesaw Mountain. Returning to Mississippi, he married Mariah Louise Bates of Holmes County, Mississippi, on January 14, 1874. His wife of 49 years, Pappy and Mariah reared their six sons and one daughter in Marietta. He returned to Marietta in 1875 to join his brother Jim at the fledgling chair factory. He and Jim became partners in Brumby and Brother in 1875, and in 1878 he moved his wife and infant son, Tom, Jr. to Marietta. In 1884, Thomas and Jim incorporated the chair factory as The Brumby Chair Co. In 1888, Thomas bought out his older brother Jim, who was retiring due to poor health and succeeded him as president of the Brumby Chair Co., a position he held until he retired in 1923. During his almost one-half century stewardship of the Brumby Chair Co., it became one of the largest chair factories in the South and one of Marietta's major employers. One newspaper columnist wrote: "Brumby chairs became as distinctive in their own province as Chippendales and Hepplewhites." He was twice elected mayor (1898-99 and 1900-1901) but modestly declined to serve a second term. He helped organize and was president of the Marietta Electric Co., which was the forerunner of the present Marietta Board of Lights and Water. In business affairs, he and James T. Anderson, R.H. Northcutt and Newt Adams organized Marietta Bank and Trust Co.
As a lifelong Methodist, he was chairman of the building committee which built the First Methodist Church at the comer of Atlanta and Anderson streets in 1899. He was also chairman of the Marietta School Board for several years and served in this capacity when Waterman Street School, Marietta's first school building, was built. At the time of his death, March 1, 1925, the Cobb County Times eulogized him as a "strong political factor in both state and county politics ...his support was ardently sought by all those who aspired to public office and he lent his hardy support to those who represented clean, honest government. He was a man with strong convictions, fearless and was an avowed enemy of corruption and lawlessness. He was a man whose purpose could never be questioned ...he achieved success in a truly impressive manner; his famous product the Brumby porch rocker, being found in nearly every Southern home." Thomas and Mariah's six sons were J.R. Brumby, Thomas M. Brumby, Jr., W.M. Brumby, and Otis A Brumby, all of Marietta; Joe B. Brumby of Philadelphia, Pennsylvania, and Robert E Brumby of Franklin, Louisiana. Thomas was also survived by his second wife, Mrs. Gerturde Mock Brumby, whom he married shortly before his death. Ironically, his only surviving brother was Jim Brumby who had brought him to Marietta 50 years earlier to help establish the Brumby Chair Co. that bore their name.